Last Week in Review: The labor sector continues to improve, while home price gains are stabilizing at more normal levels.Forecast for the Week: Look for key reports on inflation, manufacturing and retail sales. View: Navigate tax time with ease thanks to the overview below. Take this job and love it. That’s exactly what more people are doing these days, as job growth in 2014 was the strongest in fifteen years and our economy continues to improve. The December Jobs Report showed that 252,000 jobs were created, a touch above expectations. In addition, upward revisions to October and November added another 50,000-plus jobs to what was originally reported for those months. Employers added 2.95 million new jobs in 2014, with an average of 246,000 per month, above the 194,000 per month average in 2013. Another positive in the report is that the Unemployment Rate came in at 5.6 percent. The head scratcher was a -0.2 percent hourly earnings figure. Hourly earnings are not growing and that is keeping inflation persistently low. One positive about low inflation is that it should benefit Bonds for the foreseeable future, as high or growing inflation can cause fixed assets like Bonds to worsen. 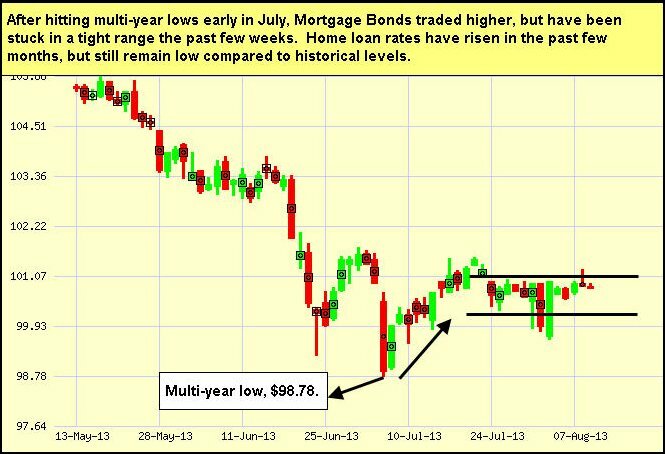 Since home loan rates are tied to Mortgage Bonds, low inflation should also help keep home loan rates low for now. 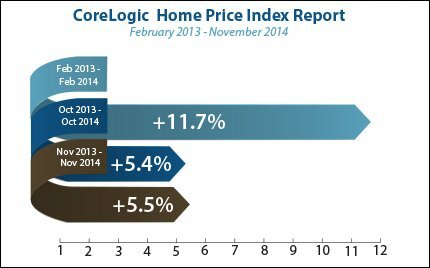 In housing news, CoreLogic reported that its Home Price Index, including distressed sales, rose by 5.5 percent annually in November. After a near 12 percent annual increase back in January 2014, prices have been decelerating, but have stabilized to a more normal 5 to 6 percent growth rate for the last four months. The bottom line is that home loan rates remain near historic lows, and now is a great time to consider a home purchase or refinance. Let me know if I can answer any questions at all for you or your clients. Last Week in Review: The Bond markets were closed Tuesday in honor of Veterans Day, while the rest of the week was quiet with only a handful of economic reports on the calendar. Forecast for the Week: The Fed minutes could cause volatility. Plus, key housing reports, and is inflation still tame? View: Check out these five tips that can help yield more productive and meaningful work relationships. 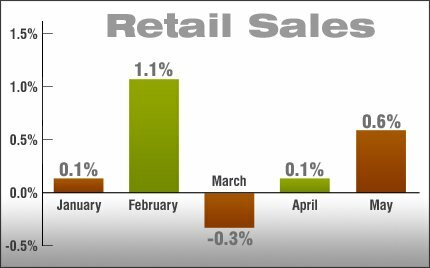 Last Week in Review: Retail Sales for May came in less than expected, while important housing news was released. Forecast for the Week: Key housing, inflation and manufacturing reports are ahead, and the Fed meets. Last Week in Review: The housing market continues to improve, plus the tapering talk carried on. Forecast for the Week: A busy week is ahead, with important inflation, manufacturing and housing news being released. View: Staying sharp is important for today’s busy professionals. Check out the simple tips below. “Every day you make progress.” Winston Churchill. And the housing market continues to progress in the right direction. Read on for details. 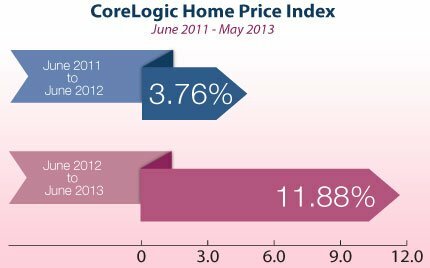 Last week, research firm CoreLogic reported that home prices across the U.S. rose by nearly 12 percent from June 2012 to June 2013. By comparison, home prices only rose 3.76 percent from June 2011 to June 2012. In addition, research and analytics firm Clear Capital said that prices rose 9.3 percent in the year ended in July. The housing markets have turned the corner to greener pastures, but it’s important to note that this pace of growth may be unsustainable. With home loan rates rising over the past several months, this rate of appreciation could slow. In labor market news, Weekly Initial Jobless Claims rose by 5,000 in the latest week to 333,000, but this was below the 340,000 expected. This followed the Jobs Report for July, which was a bit of a disappointment with less jobs created than expected. What does this mean for home loan rates? One of the biggest questions on everyone’s mind is: When will the Fed start tapering their Bond purchases? Remember that the Fed has been buying $85 billion of Bonds a month to help stimulate the economy and housing market. This includes Mortgage Bonds, to which home loan rates are tied, and these purchases have helped home loan rates remain attractive. The Fed has said the rate of their purchases will continue to depend on economic data, and could be increased or decreased accordingly. Last week, several Fed members spoke out in favor of tapering these purchases as early as the Fed’s meeting in mid-September. However, with our economy growing at sub 2 percent, economic data between now and September will be a key factor in this decision. The bottom line is that home loan rates remain attractive compared to historical levels and now remains a great time to consider a home purchase or refinance. Let me know if I can answer any questions at all for you or your clients. After last week’s slow calendar, this week features a steady stream of reports. Economic data kicks off on Tuesday with Retail Sales for July. This comes after a decent reading in June. Inflation data from the wholesale-measuring Producer Price Index and the Consumer Price Index will be released on Wednesday and Thursday, respectively. In the manufacturing sector, the Empire State Index and Philadelphia Fed Index will be released on Thursday along with Weekly Initial Jobless Claims. To round out the week, Housing Starts, Building Permits and Consumer Sentiment will be disseminated on Friday. Remember: Weak economic news normally causes money to flow out of Stocks and into Bonds, helping Bonds and home loan rates improve, while strong economic news normally has the opposite result. The chart below shows Mortgage Backed Securities (MBS), which are the type of Bond that home loan rates are based on. To go one step further — a red “candle” means that MBS worsened during the day, while a green “candle” means MBS improved during the day. Depending on how dramatic the changes were on any given day, this can cause rate changes throughout the day, as well as on the rate sheets we start with each morning. As you can see in the chart below, Bonds have improved from multi-year lows in recent weeks. I’ll be watching closely to see if they can improve further. Many people think intellect is a matter settled at birth, and mistakenly believe there’s no way to boost their brain brilliance. But scientific studies prove just the opposite. In fact, small lifestyle adjustments combined with a few mental gymnastics can not only increase intelligence, but also improve general brain health, helping prevent aging disorders, such as Alzheimer’s disease. According to most neurologists, the key is staying mentally active, whatever your age. The following tips will help boost your mental acuity and increase your intelligence. All You Have To Do Is Dream. An adequate amount of restful sleep is an important component of brain function (its effect on memory and learning is contested among scientists). Restful sleep provides energy as well as the ability to focus, both vital factors in achieving mental stimulation. Some studies have also shown the reverse to be true, that is, that more mental stimulation during the day gives you better sleep at night. Jumpin’ Jack Flash Memory. Exercise brings oxygen-rich blood to the brain and regulates blood-sugar levels. Exercises such as aerobics, dance, and martial arts all require memorization and are great for promoting mental stimulation. They also help to develop the rhythm and timing circuitry that runs across multiple regions of the brain. Playing Those Mind Games Together. Crossword puzzles and Sudoku, board games and card games are all excellent for mental stimulation–now you can add video games to the list. Each type of game makes various demands on brain function such as recall, hand-eye coordination, attention, memory, logic, and pattern recognition. The key here is to keep upping the skill or level of challenge as you progress. Don’t forget to pass these helpful tips along to your clients and colleagues. The material contained in this newsletter is provided by a third party to real estate, financial services and other professionals only for their use and the use of their clients. The material provided is for informational and educational purposes only and should not be construed as investment and/or mortgage advice. Although the material is deemed to be accurate and reliable, we do not make any representations as to its accuracy or completeness and as a result, there is no guarantee it is without errors. Vantage Production, LLC is the copyright owner or licensee of the content and/or information in this email, unless otherwise indicated. Vantage Production, LLC does not grant to you a license to any content, features or materials in this email. You may not distribute, download, or save a copy of any of the content or screens except as otherwise provided in our Terms and Conditions of Membership, for any purpose. Last Week in Review: The Fed meeting minutes were released, and wholesale inflation is heating up. Forecast for the Week: Look for important inflation, housing and manufacturing news. Plus, earnings season continues. View: More and more people are listening to podcasts. Find out how they can help your business with the easy tips below. “And I kept on looking for a sign.” Climax Blues Band. The markets were certainly looking for a sign from the Fed meeting minutes that were released last week, regarding when the Fed may begin tapering its Bond purchase program known as Quantitative Easing. Read on to learn what the Fed revealed, and other key news from last week. The minutes from the Fed’s June meeting of the Federal Open Market Committee showed that the Fed’s Bond purchases will be contingent on how the U.S. economy does. Some members said further labor market improvement is needed, while several said a reduction in purchases would soon be warranted. 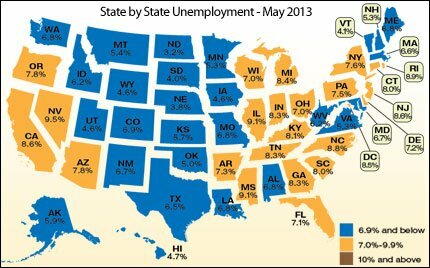 In terms of the labor market, regional and state unemployment rates were little changed in May. Twenty-five states had unemployment rate decreases, seventeen states had increases, and eight states and the District of Columbia had no change. And while the Jobs Report for June looked strong on the surface, when you dig into the report a lot of the jobs created were for low-paying jobs and part-time help. In addition, for the 18-29 year age group, the Unemployment Rate is a staggering 16.1 percent.